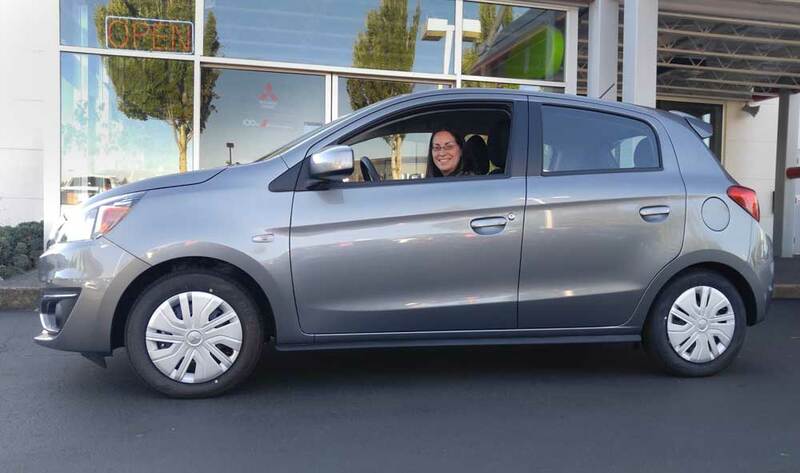 It almost goes without saying, but our 2017 Mitsubishi Mirage has tiny wheels and tires. Our ES model has skinny 165/65/14 low rolling resistance Dunlop Enasave tires mounted on narrow 14x5.5 steel wheels with hubcaps (gasp!). Twenty years ago, many cars came with 14s. Nowadays, not so much. 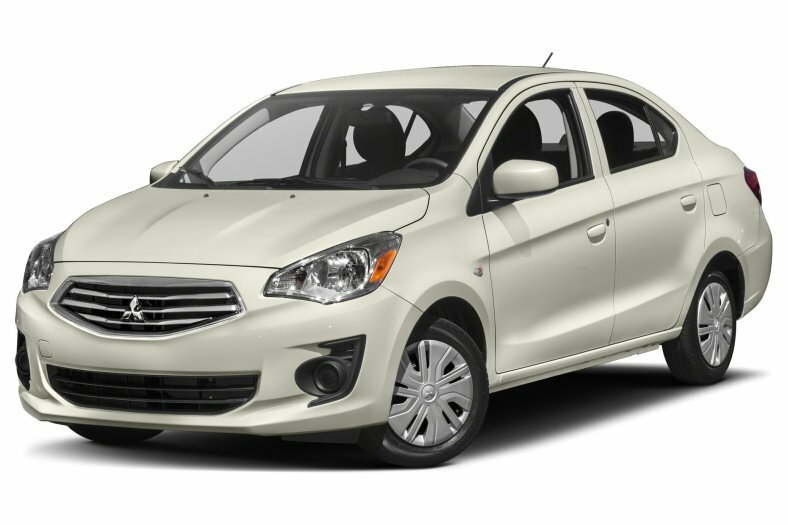 In fact, I believe only the Mirage and the Hyundai Accent still come 14s from the factory. The good news about these narrow low rolling resistance tires is since they're made from a compound harder than recycled bowling balls and narrower than most mountain bikes these days, I could probably coast from Portland to San Francisco. The bad news is, well, pretty much everything else. They don't offer much grip, handling isn't so great, and the odd size doesn't allow for many choices in replacements. 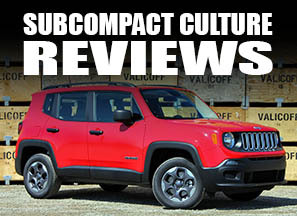 Since fewer cars wear these smaller sizes in general (e.g. 14s), the old law of supply and demand kicks in. Fewer people are buying them, so it's likely the volume decreases, there are fewer options, and the price goes up. For example, Discount Tire Direct only offers two options for a non-winter tire in 165/65/14. One is the Chinese-made GT Radial Champrio 128 at $46.96 a tire (admittedly super cheap), and the other is the Bridgestone RE92 for $92.69. So, if you're an everyday consumer who walks into your local tire store or visits an online retailer, you'll be offered just a couple of choices for the OE size. Now, those of us who are more tire-savvy know you could also buy a 185/60/14 (just 1.3% larger diameter) and have far more choices—47 to be exact at Discount Tire. Granted, you'll lose some fuel economy if you go to a wider 185 from the skinny-mini 165s, but hey, at least there are options. When you're talking about 14" wheels, however, things get pretty abysmal. Discount Tire Direct offers nine choices for 14" wheels. Six of these styles are hideous and one is a steel wheel. Needless to say, 14" wheels aren't too popular either these days. If you're addicted to car parts a gearhead like me, I surf craigslist, OfferUp, forum sites, and Facebook groups for wheels and tires. Since I happen to be looking for snow tires (and possibly wheels for them), I've noticed finding 14" rolling stock is getting rarer and rarer. There are old VW wheels, some Honda Civic wheels from time to time; even some Miata stuff occasionally. But finding 165/65/14 snow tires is almost impossible. There are some 185/60/14 from time to time, and sometimes even some 175/65/14. I've also found a couple sets of puny 13" wheels/tires for sale. And from what I've read on the Mirage Forum, I can actually run 13s. In fact, it might not be a bad idea for a winter setup. I can buy brand new 175/70/13 snow tires for $37 USD! Then the challenge becomes finding 13" wheels. It used to be that 4x100 was one of the most common bolt patterns around. After all the venerable Honda Civic had a 4x100 pattern, and everyone made wheels for those. Then again, the Civic hasn't run a 4x100 bolt pattern since 2005—that's 12 years. I'm getting old. GET OFF MY LAWN! Sure, there are still a fair bit of 4x100 options when looking new, but the styles I like generally are now only available in 15x8, suiting the latest trend in customizing (where were these back in 2005 when I had a Scion xB?). That leaves few 15x6.5 or 15x7 wheels that I like and that are lighter weight. Also, there are fewer and fewer decent looking 15x6.5 and 15x7, 4x100 wheels on the used markets too, in my not-so-humble opinion. I suppose this is one of the perils of dealing with the Mirage, which admittedly, isn't exactly the most modern or cutting-edge car. But that's OK. We'll find both winter wheels and tires and some lightweight alloys and sticker 15s here in the coming months. And while I'm waxing philosophical, It's interesting to see the evolution of automotive wheel and tire sizes. I had a 1979 Civic 1200 with 145/80/12 tires. That's pretty tiny. Shoot, I remember when the drastically restyled Dodge Ram pickups came out in 1994 and you could get a 17" wheel option! I remember thinking that massive 17" wheels on a pickup was radical. Now, a 2017 Ram is available with factory 20" wheels. Times change. Wheels and tires get bigger. Except for the Mirage. The Mirage still runs 14s. At least ours does. For now. My old '88 Subaru Justy came with 12 inch tires. I could go down to the local tire shop and buy these odd ball tires made in Czechoslovakia and Yugoslavia for $9.99. The one brand I remember was Tigar, and I just looked and apparently they are still in business (now a subsidiary of Michelin). Good for them! They lasted longer than both Czechoslovakia and Yugoslavia! Any business that lasts longer than former communist eastern European block countries is a winner in my book! And $9.99? That's insane. We had a 1979 Honda Civic 1200 in college and it had 145/80/12 tires. We never had to replace them, however. I honestly don't think 13" wheels will fit on a 2017-18 Mirage. The larger front brakes will not give you enough clearance. 13" wheels will work on the 2014-15 Mirage with smaller front brakes. For snow I would always stick with skinny tires over wider tires, especially on small cars. I base that on driving a 1990 Ford Festiva for 14 years in Wisconsin. Its 145SR12 tires were unstoppable in snow, even though I never purchased snow tires for that car. Meanwhile any small cars (example: VW Golf) that I have owned with wide tires have all been horrible in snow, even if with snow tires. The Golf was a blast to drive in the summer, but it was not a good winter vehicle. I blame that on tire width more than anything. Simple Tires & Tire-Easy offer a few more choices in 165/65r14 tires. 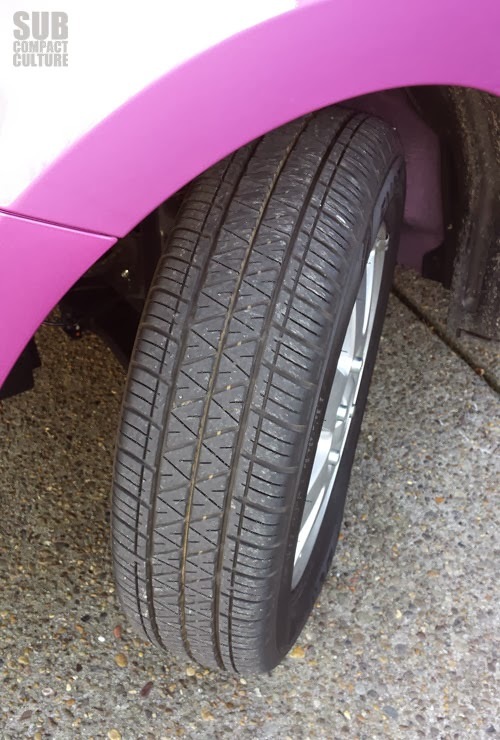 I added 165/65r14 Nokian Nordman 7 non-studded snow tires to the front of my 2017 Mirage this winter, and it has done quite well in the snow. 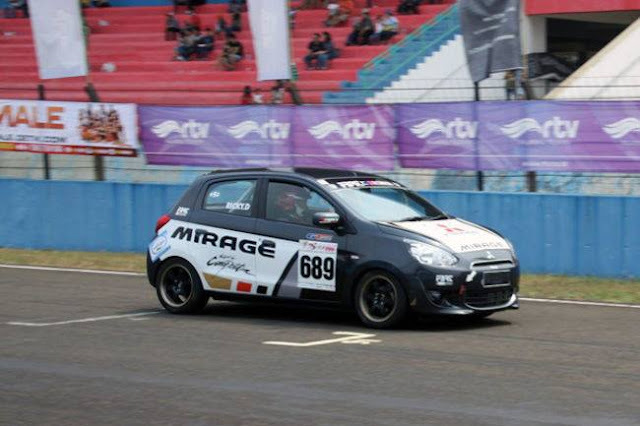 I do wish the Mirage came with a more popular U.S. tire size, however.